You can configure manual or automatic daily backups of your content and component definitions in Storyblok with the “Backups” app. This adds additional security and lets you restore the backups created on your personal Amazon AWS S3 bucket. To setup backups you will need an Amazon AWS account and be subscriber of Storyblok’s “Advanced” plan. If you don’t have an Amazon AWS account yet you can click here to signup. 1. Install the app “Backups” in the app section of Storyblok. 2. Go the the space settings page and click on the “Backup” tab. Under “Show setup instructions” you can find the template for the access policy you will need in a later step. 3. Sign in to your Amazon AWS console and create a S3 bucket in region us-east-1. Insert the bucket name under the field “S3-bucket” in Storyblok. 4. 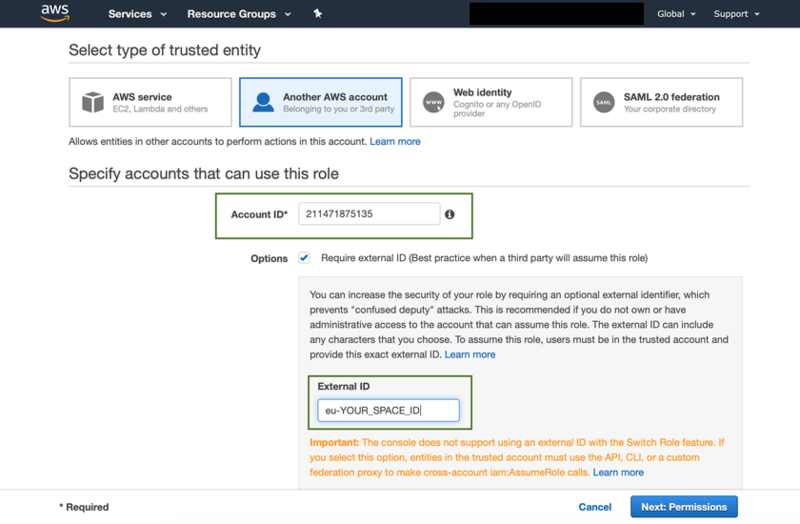 Go to the identity and access management (IAM) area on Amazon AWS and create a new role. 5. Select “Another AWS account” as entity type, insert 211471875135 as “Account ID” and your space id prefixed with “eu-“ as “External ID”. 6. In the next step you will need to assign an access policy for your S3 bucket to the role. 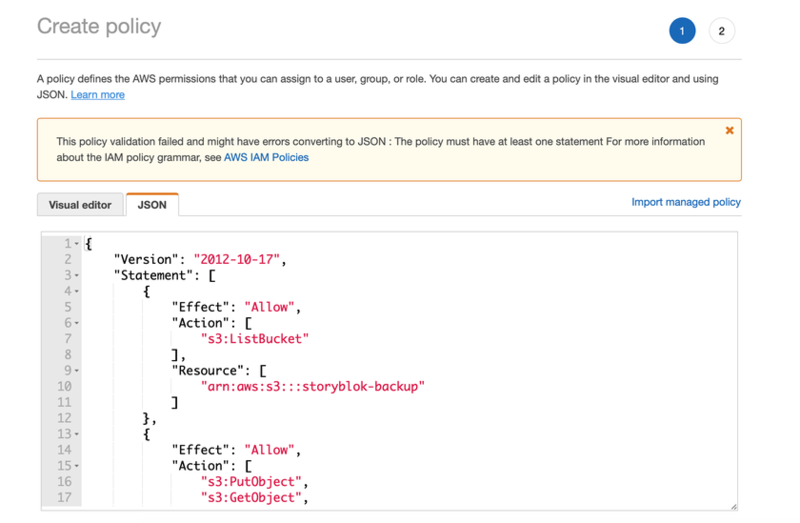 If not created yet choose “Create policy” and add the policy template you can find under “Show setup instructions” in Storyblok. Be sure to replace YOUR_BUCKET of the template with the real bucket name created in step 3. 7. After creating the access policy click the reload button on the right and attach the S3 access policy to the role. 8. In the last step define a role name and click “Create role”. 9. 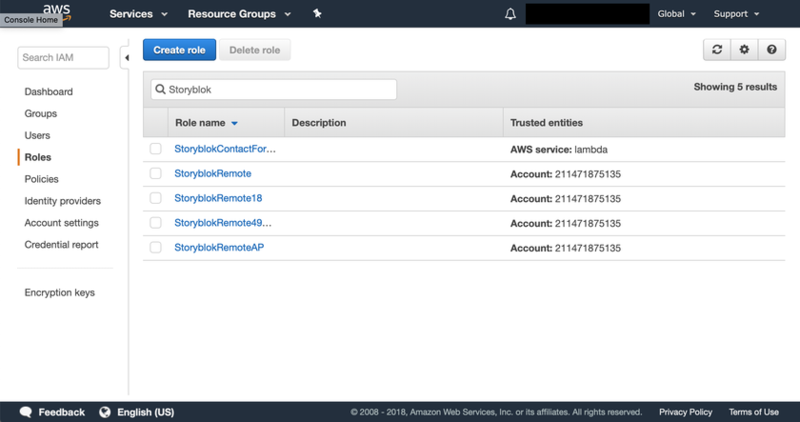 Go to the detail view of the created role and copy the “Role ARN” to the “AWS ARN” field in Storyblok. 10. After saving the changes you should see that the “Backup now” button switches to green. 11. Test the backup by clicking the “Backup now” button. When the backup is complete you should see it by clicking on the button “Show latest backups”.